Today is a good day for counting your blessings and knowing that you’ve come by to a place in your life where you’re aware of what (and whom) truly matters most. The Ten of Cups tells you that you’ve achieved something worth acknowledging and celebrating, as seen here in the imagery of this card. The Ten of Cups is all about fulfillment and security; a solid foundation of abundance and prosperity, and the sense that you have built something you can take pride in. This extends well beyond financial or material security. It’s more about family, lasting friendships and a comfort — in your home and your community — surrounded by people you love. In this version of the card we see two strong arms — a man’s and a woman’s — lifting a golden chalice up in a show of harmony and unity. 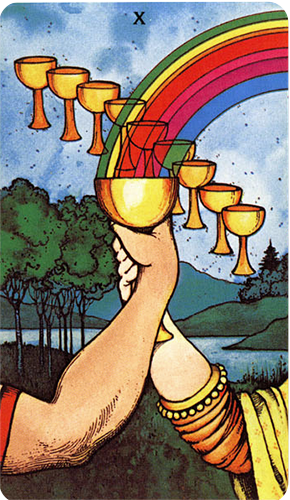 A colorful rainbow pours into the chalice, while nine more cups are lined up like a staircase behind them, reminding us of the steps that have been taken to lead us to where we are today. The landscape behind them is serene and peaceful, with lush verdant hillsides and trees. Even the surface of the water is calm.. The Ten of Cups is all about embracing all you’ve established through your connections and interactions with others. It’s about happiness and security in the areas that matter most — with family, friends and loved ones. This is not the time to think about what is lacking in your life but rather what makes it complete. And while you don’t want to be resting on your laurels, it’s important to acknowledge those who are most important to you and who keep your cup continuously full. The Morgan Greer is a beautiful deck by Susan Gerulskis-Estes (Creator) and Bill F. Greer (Illustrator).